Continuing your intensive grazing rotation during the winter months depends on creating the perfect winter pasture crops for winter grazing. In other words, the success of your winter rotational grazing program starts with how well you prepare your pastures during the growing season. Winter grazing is NOT about using up your summer pasture leftovers or cleaning up the last whisper of grass re-growth in your hayfields after the growing season ends! Intensive grazing during winter is about having a carefully thought-out strategy to create highly nutritious pastures that will withstand the ravages of frost, wind, rain, and snow so you can continue your intensive grazing program even when the snow has piled up in your pastures. Successful winter grazing is all about having a plan. By the end of your growing season the pastures that you have set aside for your winter pasture rotation need to be tall and full of highly nutritious grass. These are not the summer's leftovers. These are meticulously planned pastures tailor-made for winter grazing. Short grass is not suited to winter grazing. Snow will quickly cover it over and knock it flat. Use your daily pasture rotation during the growing season to keep your pasture grass from going to seed so that your pasture crop at the end of the growing season is lush and full of nutrients going into the winter. Create tall winter pastures that will stand up well through snow. By mid-summer, start modifying your pasture rotation so that you maximize the height of the pastures that you are saving for winter grazing. You need to graze the your winter pastures late enough during the growing season so they don't go to seed, but early enough so that you can maximize grass height in the pasture before the autumn frosts. Creating an ideal winter pasture is very similar to creating an ideal hay crop. By the end of the growing season, your ideal winter pastures should have just reached the peak of their maximum growth, but with no more than a few seed heads starting to appear among the grass. This tall lush grazing crop is ideal for rationing out during the depths of winter, one slice at a time, as you continue your intensive grazing rotation during the winter months. Mature grass that has gone to seed also is not suited to intensive grazing in the winter because too low in nutrients to be worth digging for through snow. Before touching your carefully prepared winter pastures in the fall, use up all the sparse re-growth in your other pastures and hayfields so you can clean up all the short grass that would be crushed flat by the first significant snowfall. This allows you to save the tall tailor-made winter pastures for intensive grazing when the snow begins to pile up. This same set of principles applies to areas whose winters are snow-free. Use up all the short grass leftovers in pastures and fields first before they become parched and dry while saving your lush, resilient, tailor-made winter pasture crop to ration out with your intensive grazing program for the remainder of the drought or dormant pasture season. Grazing Rule #6: Use your pasture rotation during the growing season to prepare perfect pastures for winter grazing. Tall, high-quality pastures that have been prevented from going to seed by your pasture management during the summer grazing season will require the least supplementation, will entice your cattle to graze longer, and will stand up best to the ravages of wind, rain and snow. The end of the growing season marks the non-negotiable date by which time your winter pasture crop needs to be ready. That deadline needs to remain at the very forefront of your focus all summer long! The perfect winter pasture is tall, nutrient-rich, has strong stalks that stand up well to wind, rain, and snow, but the majority of the grass has not yet gone to seed. High in nutrients: Winter grazing depends of starting with good quality grass pastures at the end of the growing season (high in protein, energy, and minerals). While you can make up for minor nutrient deficiencies through your nutrient supplement program, the pasture quality must be worth the cattle's effort to dig for it through a cover of snow. Starting the winter grazing season with poor-quality pasture requires too many expensive supplements and at some point the cattle would simply refuse to graze it because the effort to do so would require more nutrients than are available from the grass. Taste and texture: Winter grazing is also about having tasty pasture. Cattle will only forage through snow if the pasture underneath is palatable. Good quality pasture will be much more palatable and stay palatable longer than dry overly mature pasture that is low in nutrients and has already gone to seed. Are you expecting your cattle to dig through snow to find 'yummy cookies' or 'stale bread'? 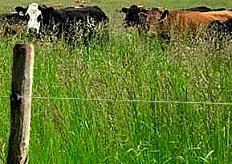 Resistant to leaching: High quality pasture will preserve its nutrients much longer against the ravages of rain, frost and snow than poor quality or overly-mature grass. Growing grass has the added protection of a waxy outer coating that helps seal out moisture, which significantly improves its 'shelf life' even after it is frost-killed at the end of the growing season. Easy to find through snow: Your winter pasture stand must be tall enough that the cattle can find it under snow. Once they find it, they will dig deeper to graze it. But if the pasture grass is completely covered over by the snowpack, they probably won't break the crust to search for it. Tall grass leaves a trail of cookie crumbs for the cattle to follow. Monitor pasture quality throughout the year by taking monthly forage analyses. Use a livestock nutritionist to design a mineral, protein, and energy supplement program based on these forage analyses. Use these nutrition supplements to make up for minor nutrient shortfalls in winter pasture quality. This will prevent your cattle from losing body condition too quickly so your cattle can safely continue their intensive grazing program for longer during the winter grazing season. Strong enough to stand up through wind and snow: Tall grass (that has not dried out and gone to seed) is much stronger than really young grass that still hasn't formed any grass stalks. Pasture that is knocked flat by snow will be difficult for the cattle to graze. Once knocked flat the grass becomes more susceptible to nutrient-leaching by moisture at the soil surface, it may easily become encased in ice that forms at ground-level, and it's quality will deteriorate much quicker because it will be within reach of the soil microbes. The short pasture re-growth that grows after the final cut of hay is harvested in the late summer simply isn't going to be strong enough to stand up to the weight of the snowpack. It will be quickly buried, crushed flat and be lost to your grazing herd forever. Likewise, pasture that has been allowed to get overly mature and go to seed will be brittle and will easily be crushed flat against the earth after the first heavy dump of snow. Only pasture that is tall, with strong stalks, but which has not yet gone to seed, will stand up well to wind, rain and snow so you can continue your intensive grazing program deep into the winter. Tall enough to keep the snow from crusting over: Tall grass that pokes above the snow's surface will conduct energy from the sun down into the snowpack (like a candle wick). This process is called 'solar wicking'. It causes the snow immediately surrounding the plant to re-crystalize into a sugary granular texture, which keeps the snow loose around the plant. This allows the cattle to easily dig through the snow to find the pasture grass. But as soon as the snowpack covers over the top of the grass, the snow will become harder and more difficult to dig through. As long as the grass tips are accessible through the top of the snow, it will keep the snow around the grass loose even if the rest of the snowpack turns to concrete after a bad freeze-thaw cycle. 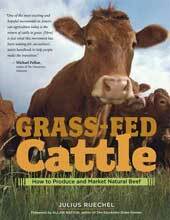 You can learn more about this process of 'solar wicking' and how to use it to your advantage while grazing your grass pastures in the winter by reading the Planning for Winter Grazing chapter of Grass-fed Cattle. Even if you graze year-round, ALWAYS keep an emergency hay reserve to account for the unexpected. Hay is better than silage as an emergency feed reserve for your intensive grazing program because it will store for many years without spoiling and can easily be sold and transported if you want to 'refresh' your unused hay reserve from time to time. Whether it's the winter storm of the century or a minor grazing shortfall during the summer, having an emergency hay reserve provides huge flexibility to your grazing program and is a very wise insurance policy for any grass-fed beef operation. As you can see from this list, your pastures for intensive grazing during the winter have to be very carefully prepared during the growing season. Its a winter crop. Your summer preparation is the difference between being able to continue your intensive grazing rotation deep into the winter or having your cattle line up at the gate to wait for a feed wagon as soon as the first snowflake rears its head above the horizon. Your grazing cattle herd and the electric fence grid that you use to direct their grazing behavior are the two primary tools that you use to prepare your perfect, tall, high-quality winter pastures. Think of your summer pasture rotation as your strategy to create the perfect pasture 'crop' for winter grazing, which your cattle will harvest one slice at a time once the growing season comes to an end. While you can use your daily pasture rotation to turn any pasture into a suitable winter grazing crop, there are some plant species that are more suitable to winter grazing and will stand up longer during the winter months than others. 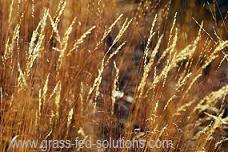 Adding some of these grass species into your pasture mix will create a more robust winter grazing crop. Variety in your pasture mix is extremely beneficial to help you extend the duration of your intensive grazing program. Different grass species mature at different times, they have different peak growing seasons, and each variety is either less or more resistant to nutrient leaching during the winter months. Unlike a hay crop that needs to be harvestable all at once, your pasture needs to provide consistent grazing for as much of the year as possible, both during and long after the end of the growing season. Pick a variety of pasture grasses so the mix provides grass growth as early as possible in the spring, throughout the hot dry summer months, and through the cool wet fall. Your pasture mix also needs to stand up well through the weather challenges that your intensive grazing program will face during the cold, wet, or snowy winter months - include leaching-resistant varieties that retain nutrients through the winter grazing season, are strong enough to withstand a heavy snowpack, and are tall enough so that at least a portion of the grass will continue to protrude through the surface of the snowpack in your area. This is even more critical in areas with a heavy snowpack - you need at least some grass species in your pasture mix to be tall enough to stick out through the surface of the snow to provide a trail of cookie crumbs for your cattle to follow and to ensure that the solar wicking process described above continues so that your snow does not crust over completely during a freeze-thaw cycle. Annual crops, such as sugar beets or grazing corn, can be used for winter grazing. 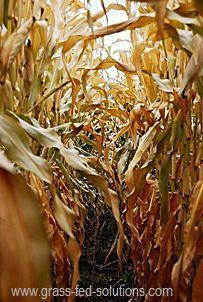 Grazing corn should be planted late to prevent cob formation so nutrients stay in the leaves. Corn is just a tall grass variety (it only becomes a grain when it goes to seed). It can be a great insurance policy against heavy snow, though annual planting means it is never quite as cheap as grazing perennial grass pastures. Different plant species will outperform in each season. Encouraging a variety of plant species to thrive in your pastures (cool season grasses, warm season grasses, and tall hardy winter-grazing species like Altai Wild Rye) means that you create pastures will serve you throughout the entire year, rather than overwhelming you with a single crop of a single grass species while leaving you wanting at other times of the year. 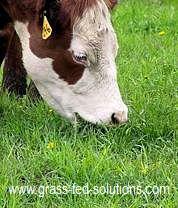 You can learn more about choosing grasses for your intensive grazing program, how to add them to your pasture mix without re-tilling your pastures, and how to use annual crops like grazing corn to broaden your arsenal of winter grazing crops in the 'Grass and Grazing' and the 'Preparing for Winter Grazing' chapters of Grass-fed Cattle. I also encourage you to visit your local livestock extension agent and your local seed supplier to find the pasture grass varieties that will thrive best in the climate and environmental conditions that are unique to your area. 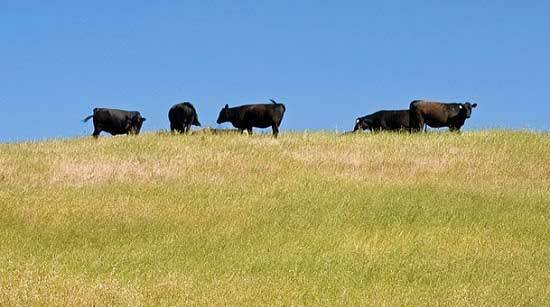 How to manage your cattle grazing program after the growing season ends. The Daily Pasture Rotation - (Grazing Rules # 1-4) The day-to-day pasture management rules at the heart of all grazing programs. Pasture Management - how to use your electric fence grid as your primary pasture management tool.